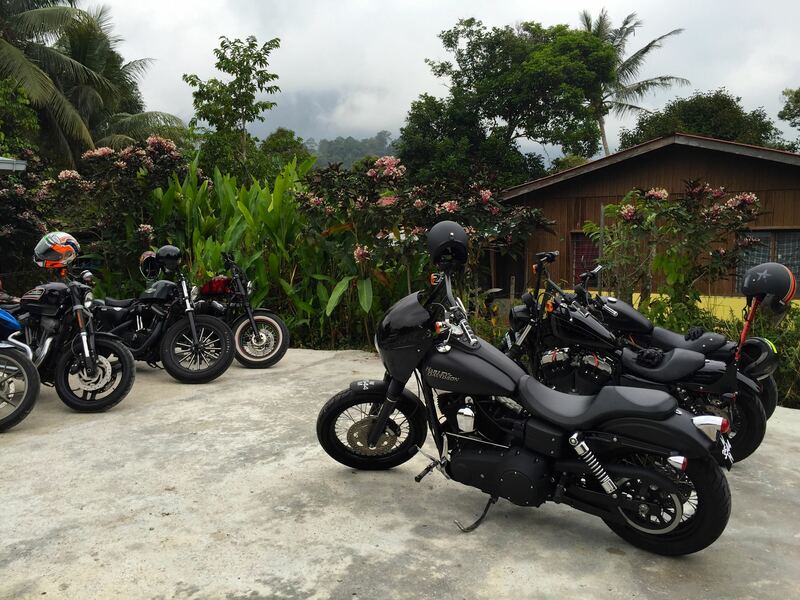 Sunday’s ride was posted as HOA to Sempah to Janda Baik. What this usually means in practice is that we get to the Genting Sempah flyover after 765 metres / 2,500 feet of climbing over 16.5km / 10mi and only then decide whether to continue to Janda Baik, or to turn around and ride back to the Hospital Orang Asli (HOA). I didn’t count, but I think eighteen of us started from the HOA. And all who started got to the Genting Sempah flyover. The consensus was to continue down the other side of the hill. What was not so clear was continue to where? The plan I heard was to go to Bukit Tinggi for breakfast, and then do a loop through Janda Baik. We know of lots of places for breakfast in Bukit Tinggi. 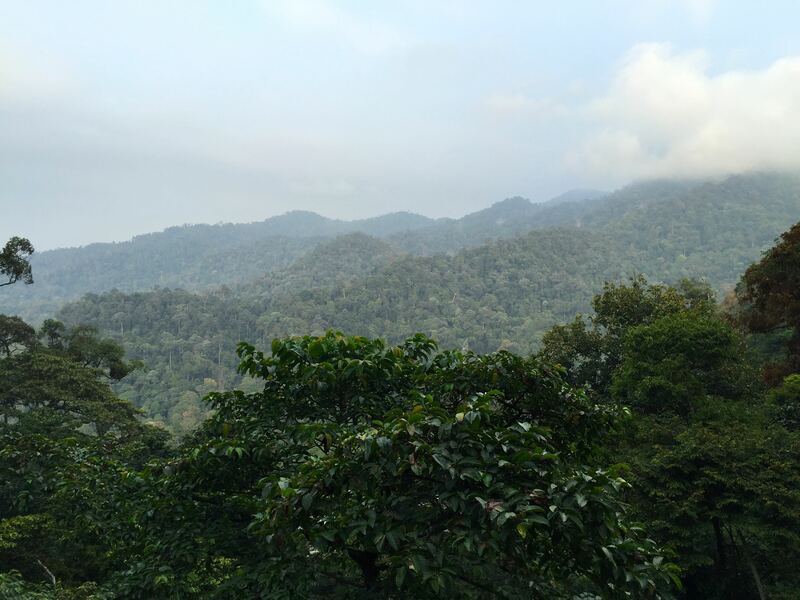 Restaurant and coffee shop choices in Janda Baik are more limited. It is a high-speed run from the flyover all the way to the slightly offset four-way junction to either Bukit Tinggi to the left or Janda Baik to the right. Much more pleasant since much of the road has been repaved. I anticipated turning left onto the blue section in the map above. Instead of turning left to Bukit Tinggi, the lead riders turned right. I had misunderstood or was unaware that the plan had changed. Now we were doing the Jands Baik loop first (green in the map above) and then going to Bukit Tinggi for breakfast. That upset things for a few of the group who needed to get back to the HOA by 11.00am or so. It was 8.40am when we got to the four-way junction. The Bukit Tinggi loop is 6.5km / 4mi long and includes 180 metres / 590 feet of climbing. With a thirty minute stop for breakfast, the guys could have been back at the four-way junction with enough time to climb the 280 meters / 920 feet over 6km / 3.7mi to the flyover and then roll down the rest of the way to the HOA by 11.00am. Getting back to the HOA by 11.00am would not be possible after doing the Janda Baik loop. The run through Janda Baik is 17km / 10,5 mi long with 375 metres / 1,230 feet of climbing. So the three who had a time crunch turned around and headed back to the HOA. The rest of us pedalled up the steep initial slope under the arch and over the rolling terrain through Kampung Janda Baik. Near the small Janda Baik police station is a sundry shop. A short stop there to buy drinks morphed into a long stop at Warung Janda Baik next door for breakfast. There were a lot of patrons at the restaurant when we got there. The fifteen of us stretched the restaurant’s capacity to the limit. We finished off all the food they had immediately available. We had to wait while they cooked more nasi lemak for us. An hour later we got on our bikes again. Having already fed ourselves, Bukit Tinggi was off the agenda. I wish I could say that we all had an uneventful ride back to HOA. Unfortunately, a patch of sand caught one of our group out. Road rash and an unrideable bike were the results. The rest of us were more than 4km / 2.5mi up the road, literally, when we heard about the mishap. Leonard commandeered this tow truck parked outside the police station at the Genting Sempah R&R to head back down the hill to pick up Henry and his bike. Nothing but the best for a R@SKL! TH had ridden past us at the R&R and gone on ahead of the rest of us, oblivious to what had happened behind him. So he was the first to the HOA car park and was able to drive back up to the Genting Sempah R&R to ferry Henry and his bike. It was not the best end to what had been a very enjoyable ride. But falling is a hazard of our sport. We are all glad that Henry suffered only some road rash. On a more positive note, many have already volunteered to help him shop for a new frame! Posted in Cycling in Malaysia and tagged Bukit Tinggi, Genting Sempah, Janda Baik. Bookmark the permalink. There were rumours that my favourite destination in Janda Baik had closed. No one had the details. 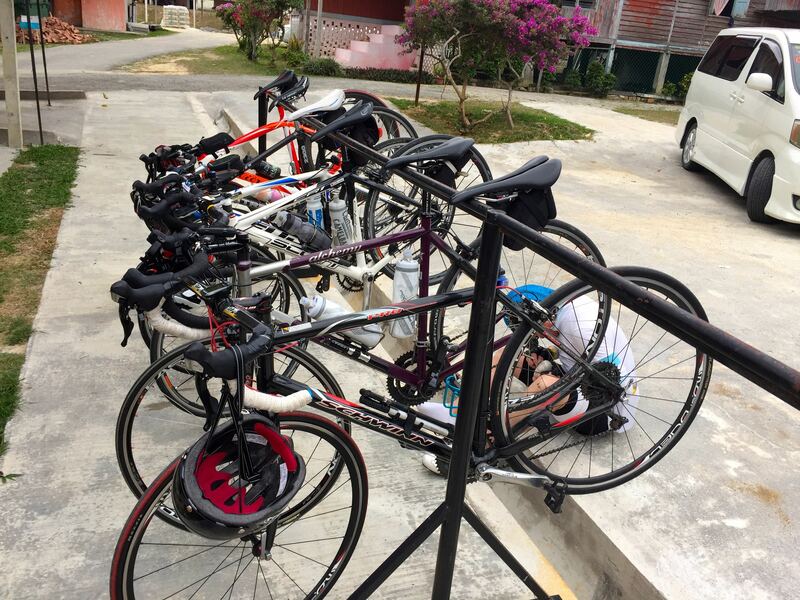 Recent rides by others to Janda Baik for pancakes and nasi lemak had apparently ended in disappointment. Hope springs eternal though. Michael from Denmark was spending a week in Malaysia visiting friends and riding his bike. I wanted to show off some of what makes cycling here so appealing. Andak’s Place is one of those things. So eight of us convened at our regular meeting point near the Hospital Orang Asli on Jalan Gombak Lama. We have all ridden this particular route many times. Apart from Michael of course. 16km / 10mi and 700 meters / 2,300 feet up to Genting Sempah, on the border between the states of Selangor and Pahang. Then a 6.5km / 4mi descent to the right turn under the arch that welcomes you to Janda Baik. Followed by a final 7km / 4.3mi and 130 meters / 425 feet of climbing over rolling terrain before arriving at Andak’s Place. The rumours were true. 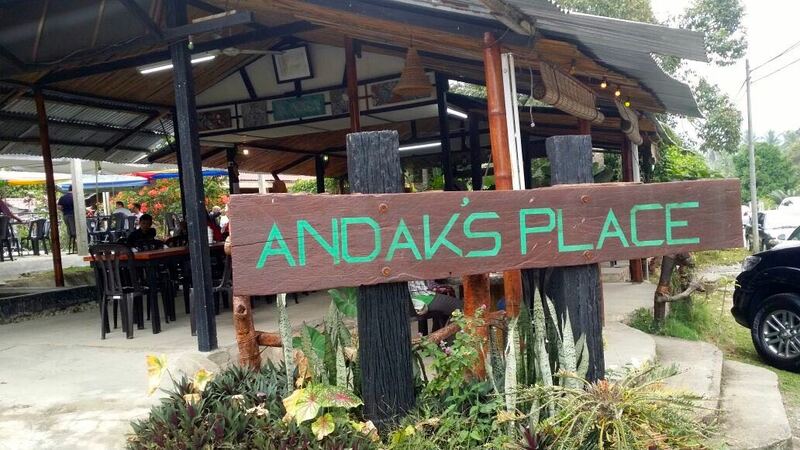 Andak’s Place was closed. Their Facebook page reveals the intention to reopen on a date to be announced. Andak’s promises to be back with a fresh concept. The Kuala Lumpur cycling fraternity is certainly looking forward to Andak’s reopening. But what to do about feeding Michael and the rest of us? We decided to try Kopi n Kraf. We ride past it every time we complete the loop through Janda Baik after we have filled our faces at Andak’s Place. We suppressed our hunger pangs for a further 5km / 3mi to the steps leading up to Kopi n Kraf, which is the café that serves the Danau Daun Chalets. The café is certainly attractive. Raised and nestled within the trees. Kopi n Kraf wins the competition for scenic views. Their menu is a little restricted on weekdays, so we weren’t able to try their nasi lemak. They did serve us some of the Malaysian breakfast classics: toast with kaya, soft-boiled eggs and roti canai. One data point is not enough to form a definitive opinion, but on the basis of our visit to Kopi n Kraf, I think Andak’s Place, as it was before it closed, wins the competition for quality of food. After breakfast there was the small matter of 345 meters / 1,130 feet of climbing over 11km / 7mi before we were back at Genting Sempah, ready to enjoy the 16km / 10 mi descent back to where we had started. I hope Michael enjoyed his stay and the rides he did in Malaysia. Come back soon Michael, and come back soon Andak’s Place. Posted in Cycling in Malaysia and tagged Andak's Place, Danau Daun Chalets, Genting Sempah, Hospital Orang Asli, Janda Baik, Kopi n Kraf. Bookmark the permalink. It has been raining a lot lately. Quite a few night rides have been cancelled because it was too wet. A ride planned for this morning didn’t happen because it was raining when my alarm went off. One upside is any waterfalls we pass are worth stopping at for a longer look. There are a couple on the route from Janda Baik to Chamang. The first, Bentong waterfall, is on the left as you descend from Bukit Tinggi. It feeds the Sungai Tanglir, which is on the right side of the road. The second, Chamang waterfall,feeds into the Sungai Perting. It is a bit of a climb to get to the falls, but the effort is worth it. The recent rains have added to the volume of water in these falls. A good thing for sightseers. But I do hope it isn’t raining tomorrow morning. 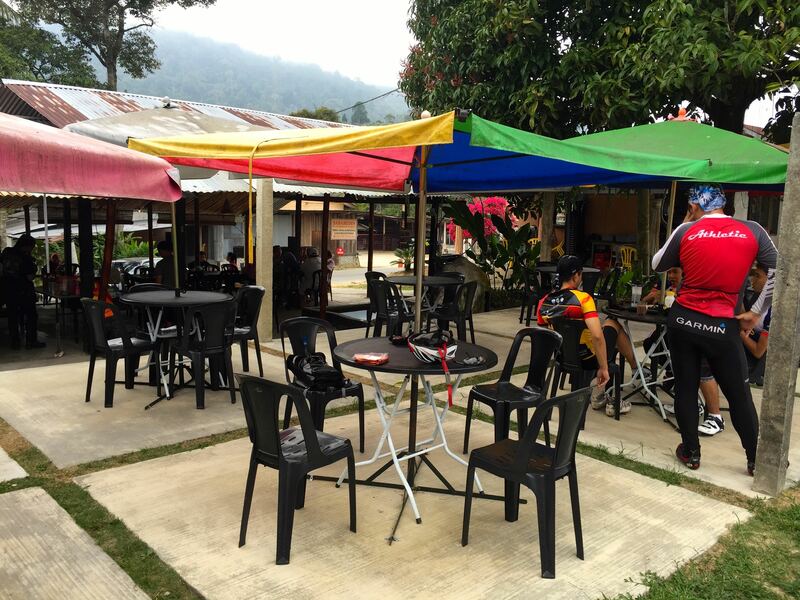 Posted in Cycling in Malaysia and tagged Bentong Waterfall, Bukit Tinggi, Chamang Waterfall, Janda Baik. Bookmark the permalink. What we want for breakfast often determines where we ride. If it is roti canai, we ride to Kampung Kundang. A hankering for duck drumstick noodles means a ride to Kota Kemuning. There are a few options if nasi lemak is the breakfast choice du jour. Genting Sempah, Kampung Cempedak or Kota Kemuning are all possibilities. Breakfast options have now grown with the discovery of Andak’s Place in Janda Baik. The ride to Janda Baik starts with the climb to Genting Sempah. The turn around point for most of our rides along Jalan Gombak Lama is either at the summit, or at the McDonald’s at the Genting Sempah R&R, one kilometer down the other side of the hill. 4 kms further down the hill toward Bentong is the right turn toward Janda Baik. There are more short but steep climbs to deal with along Jalan Cherangin before this place comes into view. Andak’s is definitely bicycle friendly. There is lots of seating, both in the main building and outside under umbrellas. The kitchen at Andak’s Place puts out a wide variety of food. Including this winner. Pancakes with butter and honey. Worth the climbing to get there. 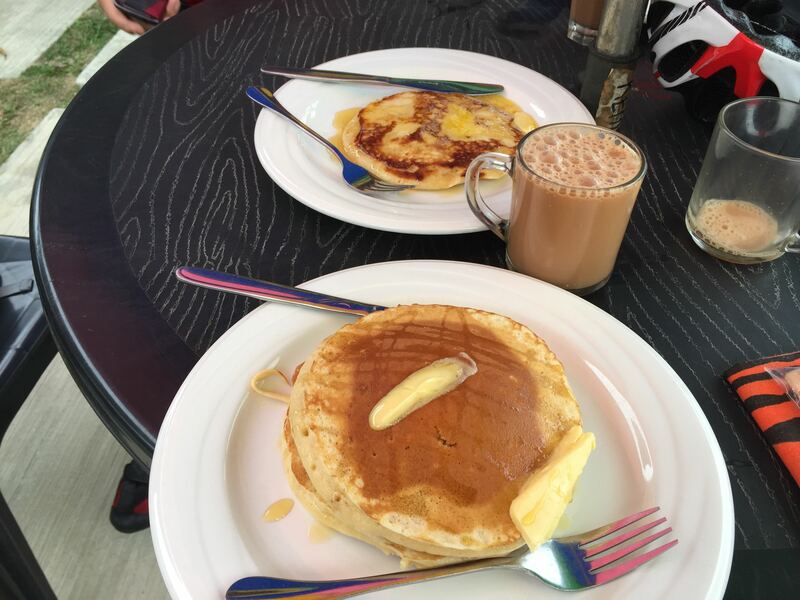 Posted in Cycling in Malaysia and tagged Andak's Place, Genting Sempah, Janda Baik, Pancakes. Bookmark the permalink. Last week I rode up to Genting Sempah for the first time since my Racun Cycling Gang friends hauled me up there on my maiden Kuala Lumpur ride three months ago. Moon, Farah, Farid, Syihan, Wan and I started a bit further down the hill this time. “So we can have a warm-up” was the reason Syihan gave me for the extra kilometers. We must have had fun last week (I admit the 20 kilometer / 12 mi descent is a blast) because Syihan, Wan and I did that ride again this morning. Azhar, who works with Syihan, rode with us. So did Galvin, Qiao, Rama and Jamali, whom we linked up with via that living map of human connections that is Facebook. We started the ride together but it wasn’t long before Azhar, Syihan, Galvin and Qiao rode up the hill away from me. I was keen to measure my effort a bit better this time. My goal was to keep my pulse below 150 bpm. I wanted to see if I could get to the summit without overheating. It was 25° C / 77° F when we started. Most of the climb is shaded so I stayed relatively cool. I needed my Sweat Gutr in the 84% humidity though. There was still a haze of moisture in the air as I rode past this brave little fellow. The rest of his peanut gallery friends had scattered into the trees as I approached. It was no surprise that my jersey was soaked by the time I had traversed the last of the 600 meters / 1,970 ft to the summit. I didn’t feel as hot or as breathless as I had the week before though. I had kept my pulse below 150 bpm as planned, except while getting up the 7.5% kicker near the top. It was a surprise that I got to the top in a little less time than it took me the week before. There is something in that “slow and steady” adage after all. The problem with feeling good during a ride is that you get cocky. There was talk of continuing on from Genting Sempah to Janda Baik. The additional 30 km / 18.5 mi were described as “rolling”. It sounded like such a good idea at the time that I even got Wan to change his mind about heading straight back down the way he had just come. 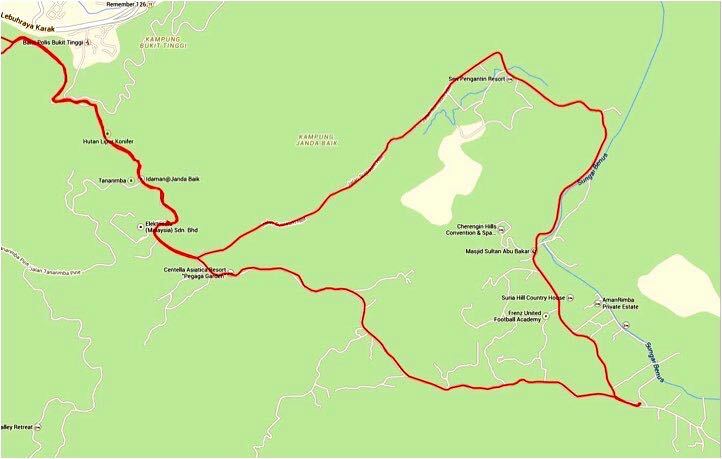 This is the profile of the ride between the summit of Genting Sempah to the turn-around point in Janda Baik and back to Genting Sempah. I leave it to you to decide if I was misled. Those “rolling” 30 km added more than 450 meters / 1,470 ft to the climbing total for the day. It was a good thing that I had rationed my efforts earlier in the day. I needed to have something left in the tank for the 1 km drag back to the top of Genting Sempah. The steepest slope of the entire ride. So I continued to modulate my efforts. The younger guys rode off ahead on the climbs. I spent much of the time spinning on my own. Literally. We regrouped outside the McDonald’s at the Genting Sempah Rest Area. Then it was time to head up the final slope and collect the payoff for all that climbing. It was time to stop holding back, stay off the brakes and chase trucks all the way down the hill. Posted in Cycling in Malaysia and tagged Genting Sempah, Humidity, Janda Baik. Bookmark the permalink.